With Serta now in the Brotherhood, it didn't take long for Orryth to take her up on her assistance. Though, the first request was not one going towards his magical abilities. With the fact that he was only using his magic as a self-improving set of enchantments, and he was mainly out fighting the enemies face to face, it would be a great idea to obtain some armor. So, his first request was to point him in the right direction to get some nice armor. Leather, or something else not too cumbersome. Serta was getting used to her new surroundings at the moment. She changed from her shaman's attire to a light garb made from linen and wool, although she retained weaing her armored boots. When Orryth found her, she was tending to her direwolf. Her wolf had light brown fur, and worn a riding harness. It seemed to be a mellow beast, but one could be sure that if needed, it could be a vicious fighter, just like the rest of the wolves that the orcs breed. When asked about armor, Serta simply showed hers. - I opt for this padded gambeson, with added chainmail reinforcements, some of which are hidden beneath direwolf fur. - She explained as she showed Orryth her armored raiment. The piece of clothing had long tassets, almost giving it a robe like appearance. - Leather I wouldn't recommend, as it's pricey to maintain. besides, if it's a doublet you want, one cut, and it'll be ruined. And making a hardened leather armor takes plenty of time, and I don't think we have it. You would also want some protection for your hands and feet as well.- She said. besides the custom gambeson, she also had a matching helm, a simple spectacle helmet , decorated with a head of a direwolf as to go with the direwolf fur on the gambeson, and a pair of gauntlets as well. - This is, at least what I wear when going in combat. There's also a couple of our spells that gives us an added layer of protection, but for the most basic of it you need to have an Earth-Spirit bound to you. - She added. Domerth and the rest had finished the route and basic plan to invade Emerdina. A scouting party would be sent to scout out the area around Rajganur, before the main force moved in. Before the scouts departed Federigo asked them to inform him personally if they had found either traces of skirmishes or of odd constructions near the town, he wanted to know immediately whether the rumors were true and get some peace for himself. Time had passed since that orc escaped and in the mean time Kree was also besieged, so no further reports could be obtained, and the lack of information irritated Federigo as he didn't want to take the responsibility of a risky venture. The party of Shadecloaks had been given a half a day's head start. They moved southwards in the early morning. Domerth gave the leader of the party a magic mirror, as a means of communication. He had also warned them not to provoke any of the green vermin if they were in the area, as most people referred to goblin kin that way. After the scouts had set off, the camp had an atmosphere of readiness, even though the men seemed relaxed. Domerth and some of the officers were in the officer's tent, and were having an audience with the Queen of Merinanth. The Queen herself, despite her age, looked quite vivid and energetic. At least her image in the magic mirror did. She was quite pleased to hear that the siege was lifted, without heavy losses. In total, the Brotherhood lost about a 1000 men, and about the same amount bore heavy injuries, and were left in the care of the healers of Kree, before they're well enough to make the journey back home. The queen had been listening to the plan that the Brotherhood made. - Very well Lord Dragonheart. I'll leave this in your hands. After all, the Cult had always been the speciality of the Brotherhood. God's be with you my lords. - Thank you your grace. We will not fail you - Domerth said. After a brief lunch, the camp was packed up, and the Brotherhood resumed it's march. They should reach the border within a couple of days. Domerth had assumed, that the party of shadecloaks, who were travelling light, would surely extend the half a day gap between them and the main force. Domerth's hope was, that they would not get into any trouble, and stay out of any unnecessary battles. Edited by JoonasTo at 21:50, 05 Apr 2018. The Shadecloak party moved on along the road at a fast pace. On the open steppe of the southern Merinanth there was nothing to slow them down in their light gear. There was little point in trying to hide on the open land either, only magic could hide one here and magic itself would give away their position to more problematic enemies. So they simply aimed to cover the ground as quickly as possible. If they were to wander upon enemies then they would simply turn tail and run, if fast enough, they might survive. "Suicide scouting" as the men liked to call it. This time they were in luck. They reached the edge of the jungle without incident. The platoon stopped to rest just inside the treeline. Far enough to be safe from eyes of the steppe but not yet deep enough to be heard by the ears of the jungle. Jade nodded to the two other dryads and they split up in opposite directions. They'd do crossing sections of the nearby forest, making sure the rest of the unit was safe from jungle wretches. The two bowed elegantly to her and vanished into the forest. Their resting spot was some distance from the "road", if it could be called that, it was more like a wandering trail, that led to Rajganur. It was already night and the human members of the party could not move undetected through the deep dark of the jungle. They'd continue before sunrise tomorrow and split into three groups. One moving along the trail, screened ahead on both sides in the woods by the two others, sweeping for any nasty surprises that could be ahead, hopefully allowing the main party to circle around and avoid them. The wings would be made of the two dryads in the group, both followed by two of the more experienced rangers. Jade, the two magic users and the ten other cloaks would make up the main party. How meticulously someone, or something, was watching the way to Rajganur would help them estimate the level of caution necessary for scouting the town itself. The march onto Emerdina had begun. They should reach the border in a few days, given the current pace through the steppes. Domerth seemed to be lost in thought as he rode. He thought of the battles to come, and those he fought already. Mostly he had recalled the battle of Onyx, and the destruction that it caused in the freehold itself. Domerth had recalled the hordes of voidspawn that were used inside the city, ranging from wild void hounds, to powerful bound void spirits. He remembered that battle. It got dragged out, due to the way Onyx was built. It was difficult to move along it's narrow streets, and these streets were the main factor on why half of Onyx got destroyed during the fighting, esspecially when the cult had summoned a greater voidspawn,one which the Samann reffered to as an Void Gargant to level the city, and draw out the Brotherhood, and the remnants of the Iron Hounds, a free company defending Onyx at the time. The battle lasted for a few months, and defeating the void gargant took a lot of effort as well. He thought on what kind of enemies they would encounter in Emerdina. There was the possibility of engaging some Khazrgors, as well as other beastmen kin enthralled by the Cult. The last time Domerth fought these goatmen, they were severely outnumbered, and they had to burn down one of the most ancient groves in the land to escape. Domerth also lost his massive battle axe in the process as well, resulting in him switching to swords instead. Whilst Dragon's Fang was a purchase from a Sapphire merchant on a market day in Beryl, Wyrm's Fury was passed down to him by his father. Both blades exhibited magical qualities, however, it seemed that they bot were more enigmatic than they appeared. Both were old blades in their own right. Both held enchantments that were a mystery even to the elders of both Clan Amat and Clan Samann. So far, the swords shared two enchantments - neither required a whetstone or any other kind of maintenance, and both seemed to be more deadly to voidspawn. Wyrm's Fury also warned his wielder of impending danger. But as the mages told Domerth, the blades have more enchantments on them, but they are dormant. They didn't knew how to awaken them, and Domerth was hesitant to experiment with them. He was content with what they exhibited at the moment. While Domerth was deep in thought, Magnus was a bit more joyful. He drank, as usual, talked with others or sang dwarven songs while riding his ram. Evening was dawning, and Domerth ordered for the Brotherhood to camp out for the night. They should reach Emerdina in a day or so, and before that, Domerth hoped to hear a report from Jade and her shadecloaks. Having followed Serta's advice on armor, Orryth was now wearing a set he had bought while exploring the markets within Kree. He decided not to go with the direwolf fur addition. Instead, he had cut up one of his robes and sewn the pieces over the chainmail. He knew it would add no protection to the armor whatsoever, but it just felt right. With camp set, Orryth gathered his evening meal, spending time with both Empellian and Dhulja. Dhulja hardly ever joined them for meals, but seemed to do so a bit more frequently the last couple days. Orryth wasn't entirely sure why there was the increase, but it didn't matter. They still had random competitions, and allowed her to join if she wanted. After dinner was completed, Orryth went to find Serta and start working on studying the scroll. Orryth found Serta conversing with Magnus and some of the senior Support Corps members by their makeshift forge area. The members of the support corps were busy repairing armor of the Steelmanes and performing other maintenance. - Aye, lass, we'll see what we can do in such short notice. - Magnus said. Serta wanted some newer weapons. A set of throwing knives, a curved kindjal and a dagger. She also requested a piece of wood, as she intended to carve another totem for the intent to bind another elemental spirit to her. And while the throwing knives, and the piece of wood were given to her on the spot, the dagger and the kindjal that she wanted would take some extra time to forge, as there were none in the armory, since Serta wanted something special, as she handed a parchement with the drawings for the designs of the blades she wanted. She turned her attention to Orryth. - For training, I presume? - She asked him. - Would you like to summon more animal spirits, or would you rather learn to bind your first elemental spirit? Binding an earth spirit should be easy. Domerth observed the training session of the New-Blades. this was their last day as such, and soon they'd be assigned to their respective corps, although many of them will become Sword and Arrow Brethren. Serta was given an exception, as she didn't need any additional training, and was assigned to the Spellweavers upon signing for the Brotherhood, as many mages were. Domerth continued the inspection of the camp. He went by the tents and wagons. The support corps were busy repairing armor, and Magnus was heating a piece of dwarven steel in the field forge, to begin forging a kindjal for Serta. Most of the men were left to their own devices, either resting or gambling. Upon returning from this routine inspection, Domerth was approached by Halfman. - No word from Jade?- He asked. - None yet. After all, it's been a day, and even with the speed they move, they've yet to reach their target I presume. - Domerth replied. - I don't like it. That Orc of which Frederigo spoke of. It's unsettling to say the least.- the sorcerer shook his head. - It isn't anything we've faced before. We rooted out some cult summoner covens before. - Aye, we did. With lesser numbers though. I do wish we had John with us. - You know him. After the whole Malus ordeal, he's more comfortable in his role as a diplomat. And besides, someone has to keep an eye on Aveline, and steer her in the right direction. - Domerth's sister, a few years his younger, was of a fiery character, and would often do something rash. - I suppose. Anyways, we've finished deciphering all that Cult gibberish by now, and we've know of their plans if Kree was to fall. It wasn't very elaborate, just carve a path through Merinanth, and besiege Vorutha for the Goblet. Amongst other things. These news didn't really surprised Domerth at all. One of the main objectives of the cult, besides bringing forth a second Dominion and freeing their god from his prison, was to collect all the Godly Relics. - You think any more of them will turn up? - Domerth asked Halfman. - Possibly. Say, did you examined the Megalith circles of Kree? - Not thoroughly, no. Just as we went past them, that's all. - Well, the circles themselves are interesting. They retell the history of our realm. The middle one had 9 megaliths, one for each. The carvings on them depiced each god and the relics they gifted for mortal kind. We've seen two. The Goblet and the Malus. There are Seven more. Or six, as some of the old legends tell, that Jagnir's relic was destroyed by Parkkun after the War of the Gods. - So what are the others relics? - There are few of which the descriptions still remain. According to them, Callista gifted her diadem, but what it did, is unknown, as most of the recordings were of elven origin, and are as such lost, save for a few select recordings that are safeguarded in the vaults of Venefica.- Halfman paused, as if regretting for saying too much. After a brief pause, he continued his lecture.- Breata's gift was known as the Plenty. It was a small, ornate box that would provide endless supplies of whatever the holder needed, be it food or construction material. Drakthan gave his bow, the description of it, is too lost, but it can be assumed that it was a powerful weapon. Ocenanya gave her spear, which is said to control seas and it's winds at the whim of the wielder. Jagnir's relic was his cloak, and the description varies from source to source, but it's most likely been destroyed, as most legends tell. Parkkun gave the mortals his staff, which was said to give it's wielder imense wisdom. An Vellyn's gift was a War Horn, that, at least to the majority of the legends, when blown three times would summon forth an army from his halls. And you know what both the Goblet and the Malus does, so I won't repeat myself here. There were a few other's as well, but most are very obscure, and there's little we know of them, save for their names. Legends speak of a Kantele, most likely Parkkun's, and a few others that I can't recall from my mind now. And they're all out there, waiting to be discovered. That's the beauty of all of it. - Halfman finished. A pair of ravens approached the camp, the dark of the evening made them almost hidden, but a distant fluttering could be heard. They suddenly changed direction and tried to storm a wagon. -MA CHE!? OH BLOODY HELL!- An annoyed Federigo shouted. He was trying to conjure up a way to make some odd spring trinkets he saw in a stall at Kree, in the meantime he left some water to boil with some herbs to experiment a new sleeping aid. The smell that came out was reminiscent of wheat, and as such it was the prime suspect for the incident. Edited by JoonasTo at 17:17, 11 Apr 2018. The scouting party reached the town without any trouble. Only a few Goblins they had to circle around. This lack of scouts indicated that if there were enemies at the town, they were not numerous enough to afford proper security. Or they were incompetent. Either way, their mission would be that much easier. A silent bird chirp nearby tells Jade that the scouts had returned. She puts down her spyglass and taps the man next to her on the shoulder. He makes way for the light skinned dryad crawling to take his place. Jade picks up her spyglass and continues to observe the fort. "The only grown men in the village are those of the army. Half-a-company at most. Sizable portion of them seem void spirits. A dozen at least." "So they've recruited the men or collected them for other purposes and just left the rest to take care of the fields." The other dryad nods. "It seems like there's been desertions as well. Nine hang by the gallows." Jade hands over the spyglass. "Recruitment probably out of the options." Observing through the spyglass she agrees. "Indeed. That looks like the cult. A lot of novices, what is up with those weapons? The cult's position seems a lot weaker than their cooperation would assume." "What does that seem to you? ", Jade points at the warlocks assembled on the courtyard. "Hmmm, a summoning circle perhaps? Could those novices be the sacrifice? Still, the lack of security is...odd." "I will go report this." Jade starts crawling backwards but stops abruptly. "Erm, what are we supposed to call him again?" A shocked look quickly turns into wicked grin. "Ooyah, ooyah, what is this now? The Captain sure is troubled, to have gained the attention of one like this." Her face turns sour. "However the Lily of the Valley is as poisonous as it is beautiful, tarien." A safe distance from the fort in case they are scanning for magic Jade initiates the mirror. "Simelenia Tel'Celeblaidenie requests an audience with Captain Dragonheart. ", even though she followed protocol her voice carried no sign of subservience, rather the tone seemed more demanding if anything. She quickly reported the situation and the lack of any sightings of flames or orcs so far. "...Tatha thinks there is something wrong here. The site is not defended as it should be. I agree. All is not what it seems." Domerth listened closely to Jade's report. He was making notes of it as well. - A skeleton crew to defend the town... A summoning circle... Novices, armed with... Repurposed farm tools, aye. That's what they arm their fodder for the most part, but don't underestimate them if it comes to combat. Seems they were very confident in their assault on Kree, that's the only reason for the low amount of men left in the garrison of the town. How many bound void spirits..? A dozen at least. That's the town covered. The fort eastwards, what about it, besides the horde of cult novices? - Domerth asked while re-inking his quill. - a preparation for the ritual? No, the cult doesn't sacrifice their own, they rely on captured slave stock for that purpose. - How big of a circle? - Halfman asked the image of Jade. She reported what her subordinates said. The look on Halfman's face changed. - That explains the little defences. Given the description the shaecloaks provided, they're trying to summon a void behemoth. - We shall reach your position in a day - Domerth said. - You are to observe them further, and report anything unusual happening. - Domerth said to the image of Jade in his magic mirror. The incessant cawing of the ravens couldn't be stopped, Federigo tried everything, covering the cages, feeding them, leaving the wagon, at one point he even tried to caw at them in return. He tried his best in pacifying the two birds, but after losing a night of sleep he decided to just let them be and forget about it. He initially planned to use the two ravens as a way to maintain communications with the main army, in case he ever found himself too far from them, but then it became apparent that the birds were too unruly for his tastes. He opened the cages, and the pair fluttered around the wagon, at that point he noticed that there was something bound to their paws, there were two small scrolls, but the writing seemed like it was washed away. He took the papers and let the ravens fly away, Federigo had no remorse about that as he thought that the recipient wouldn't have understood the message anyway. He later decided to submit the messages to Halfman, as he thought he could have reconstructed the letters with his magic or something of the sort. - Let's try to bind one of those elemental spirits. Do I need anything before we do so? I know I should have one of those totems, but should it be made of a certain material, or a certain shape? - What you'll need is focus, and be ready for a fight. The elementals won't be bound to your will without a fight - Serta said. - As of happens, I have a spare totem for you to use for capturing an earth spirit, since I wanted to bind a second one. - She said shuffling around her pouches, and moments later produced a small wooden figurine. - The scroll has the incantation one needs to recite whilst binding a spirit. He're it is- She pointed on the scroll. The incantation was written in the Orc language. - The first part is summoning the spirit itself, and the second one you recite once the spirit is weakened enough. - Serta explained the process. - We should move a bit further away from the camp. We wouldn't want to damage the gear, or injure our companions, if things go awry. It shouldn't though, as I will watch over, and intervene if something is off. They were a bit away from camp, just enough so the summoning could proceed without warning. Serta drew a summoning circle on the ground. They did not noticed Nightshade who was watching them from a distance. Once the circle was finished, Serta placed six small boulders around them. She turned to Orryth. - Now, it's all up to you Brother. Say the first part of the incantation to summon an earth spirit. Halfman examined the letters that Frederigo intercepted. He looked at the pieces of parchment, and listened on how Frederigo got them. - Ravens you say? Most peculiar, since as you know for yourself, the Cult mostly uses their little obsidian orbs to communicate. The letters are in void-tongue there's no doubt about it. I will be sure to decipher them. - Don't worry. Not everyone can recognize written void-tongue. At least you didn't mistook it for simple gibberish, as most folk do - Halfman said as he hid the notes in his robe pockets. Domerth was reviewing what Jade had reported. The Town will have to be a secondary target, as the summoning coven was a higher value target. He was given a book on Void creatures, an extensive catalogue made by the Samann. Void-Behemoths were collosal beasts standing at at least 6 meters tall, are used as living siege engines by the Cult, with Clan Onshal and the Elven Dominion prior as well. The Samann scholars observed that this void best has a very thick hide, which is hard to penetrate by normal means, except the most powerful of balistae, and of course, magic. The beast's weak spots were it's eyes, as well as it's maw. The latest reports of the sighting of these beasts was the War for the North, most notably the Siege of Diamond. Domerth closed the book and lit up his pipe. He looked at the maps again, and began planning the attack on this particular bit of Emerdinan-Merinanthian border. Orryth took the scroll in his hands and read the first part aloud. He then placed it away and get his weapon readied into its shield form. Nothing happened. Orryth stared at the summoning circle, puzzled, but then noticed something rise up from it. The Earth Spirit soon stood fully before him. It was a decent size, but Orryth had expected something larger. He shrugged and got his shield ready to block any attack the spirit decided to send at him. Orryth and the spirit took some time trading blows, Orryth having to shift his weapon back and forth between its two forms. They were testing each other out. Orryth finally felt he had a decent feel for the situation and started a chant. Seeing this, the spirit decided increase its tempo, not wanting to let the mortal being to gain the upper hand. Orryth managed to block each strike with relative ease, aside from one strike which grazed him. Finishing his chant, Orryth's weapon shifted into its pickax form, and got driven into the Earth Spirit's chest. A quick yank freed it to be sent into an arm, followed by another arm. At that point, the spirit didn't seem to be fairing so well. Orryth took out the scroll to read out the other portion. With the earth spirit weakened, it didn't took long for it to be bound to Orryth's totemic figurine. The totem itself glowed as it absorbed the spirit into it, with a faint green light. - Good work. - Serta said. - Now, to summon your spirit, just take the totem in your hands and order it to appear. Either by voice, or by thought. We'll see how well it responds to your commands. - Right. Here goes. - Orryth took the totem in hand and willed the Earth Spirit out by thought. The spirit arrived before them without the previous wait. - Well, that worked. Now, we were talking about it being able to assist my armor. I think I will give that a shot. - Orryth mentally willed the spirit to boost his armor. 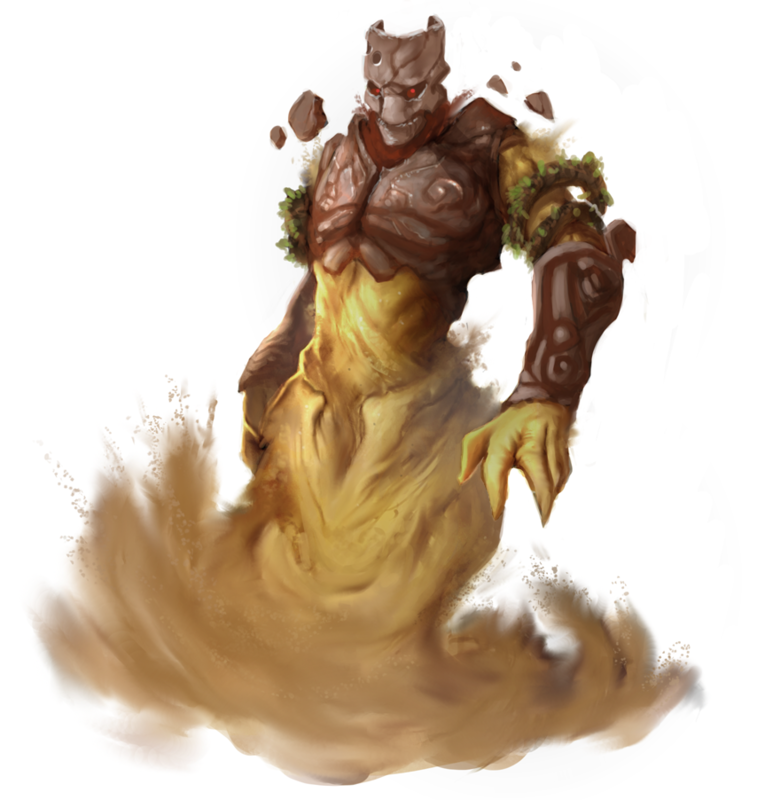 As Orryth issued his mental command, he was encased in sand from the earth spirit, forming a layer of protection around his body. The mystic sand mimicked the colours of Orryth, both his skin, hair and clothing. He could feel that the sand was providing him with some extra protection. - Oh, you're a quick learner. - Serta said with a smile. - This enchantment can absorb some blows, even those that could kill you, but remember, it does not make you invincible. And once the bond between you and the spirit strengthens, you will be able to tap into more powerful abilities.